It gets even sillier in Lethal Weapon 2. In addition to the usual motivations, the bad guys also happen to be the personification of South African apartheid! But that’s still not enough, because these guys then kill Gibson’s new girlfriend! Then, just to top it all off, one of them is taunting Gibson and suddenly reveals “Oh, by the way, we also were part of that large group that killed your wife all those years ago!” Now that’s a lot of motivation! 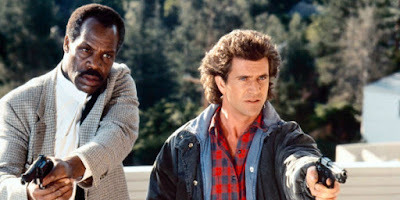 The villains of Lethal Weapon 2 are evil, snarling, Apartheid-loving South African drug dealers, but no matter how many people they kill, the police chief keeps snarling to Mel and Danny: “Forget it, guys, they have diplomatic immunity, there’s nothing we can do about it! If you touch a hair on their head, I’ll have your badge!” (Fun fact: this is not how diplomatic immunity works) What a predicament! How will our cops figure out a clever way around this conundrum? Well, they don’t: they finally just get fed up and say “Screw it!” They barge into the bad guys’ place and begin a raging gun battle. Oh no, what will the consequences be for our heroes?? Answer: nothing. They eventually call in back-up, the police arrive to help and then they all stand up and cheer together. All of those threatened consequences just disappear. 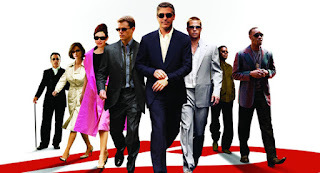 People walked out of Ocean’s Eleven feeling dazzled, so of course they made a sequel, but in the sequel (Oceans’s Twelve), they just cheated. In the final twist, they revealed that the gang had secretly achieved their goal offscreen, and everything after that was just an elaborate con. I haven't seen any of the Lethal Weapons for a really long time, but I totally don't recall the bad guys ever saying they killed Mel's wife. I remember them saying they killed his new girlfriend, but I think that was it, wasn't it? To the best of my knowledge that's correct about Ocean's 12. No real set-up or foreshadowing I don't think - there's just the montage about the egg being in some guy's backpack on a train and whatnot. H.A.T. was about America's greatest thief squaring off against Europe's greatest thief, so Ocean's 12 became the story of America's dozen-odd best grifters squaring off against Europe's greatest thief. You're off to a bad start when your heroes outnumber your not-very-threatening villain eleven to one. 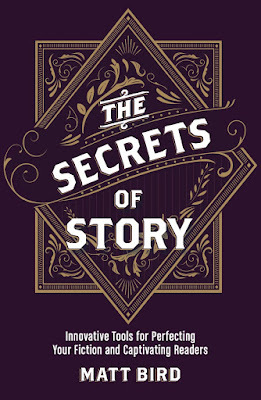 On top of that confused concept, the screenplay had to accommodate all of the original team members, plus Andy Garcia, Julia Roberts, Eddie Izzard, Cherry Jones, Topher Grace, and all the characters native to the original story. There was no time for plot OR character, so there was also no time to properly set up the twist. At least Soderbergh learned from the experience. When Ocean's 13 turn came around, Soderbergh did the smart thing and adapted the script of a much-loved ensemble heist comedy called Ocean's 11. Ah, Die Hard 3: You can't unsee Jeremy Irons in a muscle-shirt. Die Hards 2, 3, and 4 all started out as non-Die-Hard stories, so Die Hard 5 was the only story ever conceived as a sequel to Die Hard. I'm not sure about the villains of the first Lethal Weapon claiming responsibility for the death of Mrs. Riggs. That sounds familiar, but a quick check of Wikipedia, everyone's most trusted authority, claims that the Big Shocking Reveal came only in LW2. The Big Shocking Reveal in LW2 proved to be a case of hilarious timing. The movie came out in 1989, the very same year that the movie Batman had a Big Shocking Reveal that Jack "The Joker" Napier was also the thug who had killed Batman's parents! GASP! Checked the script for LW1, and Wikipedia is correct, Harvey. The villains in LW1 do not claim to have killed Murtaugh's wife. It's only the villains in LW2 who say that. I've seen the LW movies more times than I care to admit (hey, I grew up in the 80s! ), and I too have no memory of the LW1 villains claiming to have killed Gibson's wife. LW2 is just completely bonkers, and I think you've captured it well. Even as a kid (and even as I cheered on the scene) I could see the logic-hole of Danny Glover's "has just been revoked" line. Wait, wasn't the whole point that they *couldn't* revoke his diplomatic immunity? I was very confused.